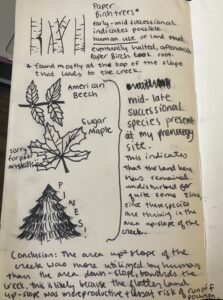 Over the time I’ve observed my phenology site, I’ve noticed many different species and drawn conclusions from these species about my phenology site. A conclusion I’ve made about the land use history is explained below. I think that the land was likely used for farming– likely dairy farming, but only the flat areas of land as it’s hard to raise cattle and grow crops on slopey and hilly land.